Cut off and discard the outer discoloured leaves from the cabbage. Quarter and remove the tough inner stalk. Shred the cabbage, wash and drain well. Layer in a basin with salt between layers, ending with a layer of salt. Leave for 24 hours which will extract the liquid from the cabbage. Wash thoroughly in cold water and drain well. 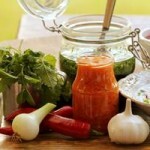 Pack into clean, sterilised jars and pour in cold, spiced vinegar. Cover the jars and label with contents and date. Note: Ready after 1 week but if you keep it longer than 10 – 12 weeks it will loose its crispness. You can use the same recipe for Pickled White Cabbage. Quick and easy and all the information i needed at a glance brilliant!!! Thank you so much for the info, now i can get pickled for christmas !! Thanks for recipe. Had checked all my cookery books for this, not one had one for pickled red cabbage. This looks so easy, even I can do it, of now to pick the red cabbage out of the garden. Thanks again. How nice to find a recipe which is not only easy but also has not left out the washing off of the excess salt. My vinegar was very strong so although I drained after washing I did not pat dry. Result absolutely gorgeous. I can remember my mum making pickled cabbage so I put the shredded cabbage in layers of salt last night. Couldn’t remember if she washed the salt off or not though. Nice clear recipe. Thank you. Thanks,this is a great recipe. didn’t think it was that easy,thanks a lot. This is a fab site, a true treasure to find well done. I will be having a go at the pickled cabbage tomorrow. 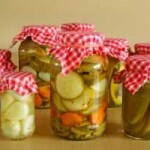 Thanks for this recipe, looked in loads of books could not find pickled cabbage .great site thankyou. Great recipe thanks, I was just wondering about the vinigar after eating the cabbage and if it can be used again or for any thing else such as a dressing? I use one of those little crinkle cutters, its both quicker and looks nicer. 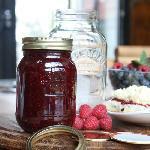 Sterilising the jars isn’t necessary unless you are going to keep it a long time. And don’t waste time catching your cochineal, it turns from violet to a lovely red without it.If you reuse the vinegar (I use malt vinegar with spices such as allspice, boiled in and strained out), best use it for salads etc unless you boil out the water it has picked up. But it has a high salt content too. The salt is NOT part of the recipe; its purpose is to remove as much water from the cabbage as possible, giving a stronger taste.So it is best to leave it layered with plenty of salt for at least 24 hours, then drain in colander for 48 hours, squeeze out more with a cloth or towel, and then give a quick rinse and drain another 4 hours. Tip the (cooled) boiled spiced vinegar over jars half filled with cabbage, and leave 3 days before eating, for the vinegar to fully penetrate. Saves time to do a whole large cabbage at once, which may need 3 or 4 litre jars; clean plastic ones such as peanut butter jars are fine. great easy to follow recipe keep up the good work. I made this – left it layered in salt for 24hrs, rinsed off the salt, padded in dry packed into jars and added the vinegar. A week later I opened a jar, it looked fantastic, but it tasted far too salty. Can anyone tell me why? Should I have left it a little longer, I used cooking salt, should I have used table salt? My Dad has done red cabbage before and his mother before him and he didn’t think that they ever rinsed off the salt but theirs was never like that. How much salt are you supposed to use, a fine sprinkle of a layer or a thick well covered layer? I used Sarsons white spiced distilled pickling vinegar. Any suggestions are very welcome. I have introduced some of them to it and they love it . I’ve lived here for 40 yrs and for some reason never I thought to make it . It was standard fare when I lived in the UK (Wales) and wish that I had asked my mother how she made it . But the recipe you publish on this website is as near to her way of making it, if the taste is anything to go by. So many thanks for publishing it. This is the 2nd year I’ve used this recipe, it’s great thanks, very easy to follow ..back hurting now I’ve pickled 6 large jars!!! Just opened a jar of this I made this year, the vinegar is red but the cabbage has lost all of its colour and is completely white. Any ideas what I have done wrong? Brilliant. Neighbour gave me six beetroots from her allotment, bought red cabbage and started pickling have never thought of it before. Thanks. What happens if you leave the cabbage in the salt for more than 24 hours? I ran out of vinegar… oops! 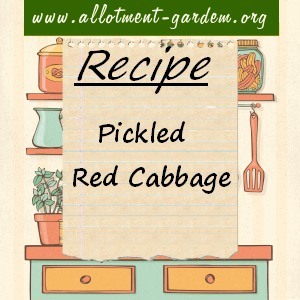 Great recipe, have still cabbage left from winter and it’s good eating. I’ve been keeping mine in the fridge, is that neseccary or is the cupboard good enough? Thank you for a great recipe, done without onions, means we can all eat it now, so difficult when you can’t have onion in your diet. can’t find recipe for Quick Spiced Vinegar. 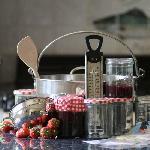 Just bought your book, easy jams, chutneys and preserves, it’s fab, thank you. My wife and I have been in Australia 25 years, we often lament the fact we cannot get any pickled red cabbage over here, from time to time we find someone who makes it at the market, this is quite often not good and nearly always expensive. I made your recipe 2 days ago. It is a chilly mid winter day in Melbourne we tried the red cabbage with Lancashire hot pot and were instantly transported back to the Manchester of our youth. It was lovely! I couldn’t resist adding a glass of Australian Cab Sav to the proceedings. My wife was amazed usually my culinary projects end up in abject failure and lots of cleaning up. 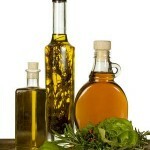 Liked the way the vinegar was infused with the spices – no lingering smell! Just opened a jar and am really pleased with the result. The cloves give it a real tang – just right for Christmas presents. The cabbage is crisp and not too salty – I gave it a really good rinse. Definitely a recipe to put in the front of my favourite recipe book and one I shall use again and again.